Lower oil prices have reduced headline inflation measures around the world. This transitory development and continuing data showing struggling growth have further focused central banks on fighting deflation rather than inflation. With the Fed also being careful not to do anything to create excess volatility or threaten less established recoveries outside the US, investors have directed their attention to equity markets in Europe and Japan. Equity and bond investors are growing comfortable being part of central bank plans to make equity and bond capital available to the economy. Overvalued equities and bonds mean lower future return for new investors, but also lower cost of capital for new issuers. This is the good news for economies around the world. The Federal Reserve’s successful stimulus strategy is increasingly being followed by other major central banks. Euro and yen currencies continue to be pressured lower against the dollar as those central banks look for more ways to make liquidity available. Except for the Swiss franc, overvaluation against the dollar is generally no longer there for the major currencies. The likely path is that more currency weakness precedes eventual strength with the establishment of economic recoveries. Valuation opportunities are in non-US large cap equities where weak economies and investor pessimism have depressed both equity prices and currencies. Non-US small cap equities are also very attractive, but to a lesser degree as they have held up better than large caps. Emerging market equities are next most attractive at near fair value. However, the cap-weighted average masks the wide range of attractiveness of individual markets. 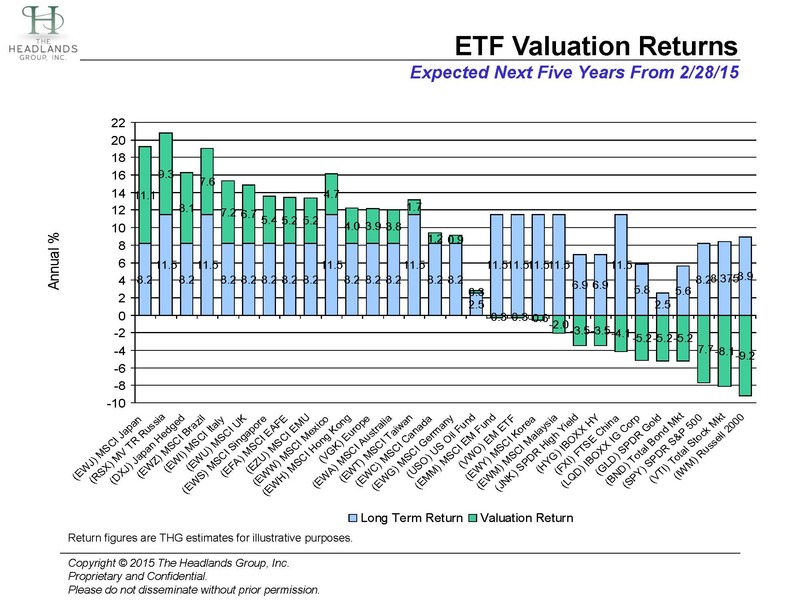 Best valuation opportunities include devastated Russian equities and the Ruble. Russia, Japan, Brazil, Italy and the UK are most attractive, while the US large and small cap, China and Malaysia pose the most valuation risk. Note also that overvalued gold poses similar risks. Aggressive world central banks continue to support all risky asset globally, while hoarding government bonds. The current extraordinarily appetite for “safe” bond investments globally from central banks, banks and investors means that new bond investors today face significant future losses before they can earn normal returns. As all bonds globally are priced relative to government, all bonds are vulnerable. Low and high quality credit spreads enjoy the same central bank support as equities, however. US high yield and investment grade credit spreads are somewhat below normal while emerging market spreads bond are well below normal. Developed market non-US government bonds offer better near term cyclical value and potential currency rebounds.